This section of the presentation will focus on some factors that may have confounded RAP efforts to revegetate the marsh. The discussion will be based on observations from several experimental planting programs carried out from 1993 to 1996 as part of the McMaster Eco-Research Program for Hamitlon Harbour (Ecowise). In 1993, Ecowise organized the Community Volunteer Planting Program (CVPP), which involved citizens and local schools. With their help, we studied the effects of carp exclusion on the growth of transplanted aquatic vegetation, and determined water-depth preferences of some key plant species. The goal of the CVPP was to workshop some restoration techniques, broadly educate the public about problems in the marsh, and gain support for the restoration project through hands-on involvement. A decision was made to carry out a pilot planting program in a small inlet of Cootes Paradise called Mac Landing. An aerial photo taken in 1950 indicated that large areas of the cattails had died out that year, probably because of high water levels. Low water levels returned in 1960, and the plant community recovered on its own. In 1972, the marsh was again showing signs of stress (i.e. loss of emergent plants that was unrelated to water levels), and by 1974, record high water levels had killed off much of the remaining cattail community. Furthermore, the marsh did not rebound when low water levels returned in 1978. Mac Landing was chosen as the site of the planting program because it had a remnant plant community. It was also relatively protected from wave and wind exposure, and its proximity to the university made follow-up monitoring very convenient. A portion of Mac Landing with different water depths and which very little emergent vegetation other than manna grass was chosen as the site. Enclosures were built and installed by volunteers, and subsequently populated with nursery stock grown by local school children. In total 44 exclosures were planted with eight different species of emergent plants. Only three species that were planted became established in the enclosures, those being the cattails, bulrushes, and arrowheads. As we began to remove the enclosures, we discovered that many of the plants were lost to muskrat grazing if the panels were removed in late summer. However, when we took the panels off in early spring or late winter, we obtained much better results. A comparison of the entire planting site before and after carp exclusion in Mac Landing is provided below. In the main portion of the embayment, there had been very little growth of aquatic vegetation during 1994 prior to the carp exclusion; by comparison, emergent vegetation extended throughout the inlet during 1999. However, it is difficult to attribute the recovery of the emergent community to carp exclusion, since as pointed out earlier, the increased growth can be explained by the low water levels experienced in 1999. A similar planting program had been carried out in Hopkin’s Bay in 1994 and in following years. 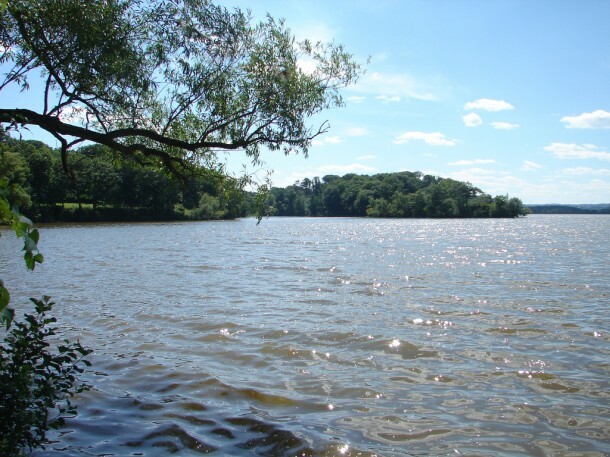 This is a portion of Cootes Paradise that receives nutrients and sediment nourishment from Spencer’s Creek and the Dundas Wastewater Treatment Facility. In the same way, a 1994 aerial survey over Hopkin’s Bay indicated little to no emergent vegetation there. 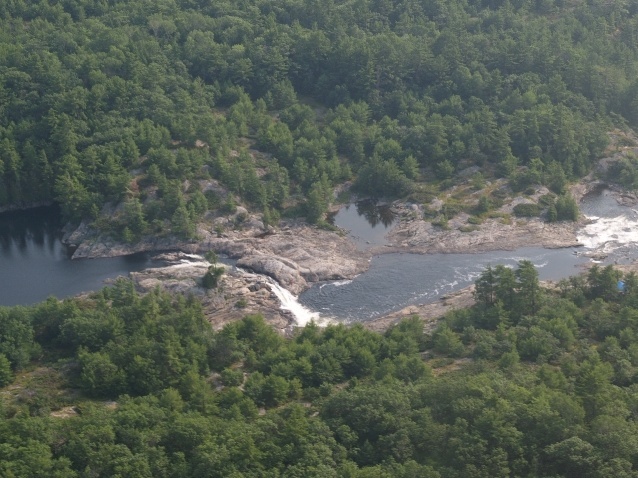 However, the low water levels in 1999 produced a similar explosion of plant growth, most of which were species that had not been part of the planting program. Here again, it is difficult to attribute the recovery of the emergent community to carp exclusion because of the predicted inverse relationship between percent cover and water level. Historically, submergent plants have grown well interspersed among the emergent stands, protected from wind and wave action. Currently, the only species that can grow consistently in the windswept turbid water is sago pondweed (Potamogeton pectinatus), a variety known to be very tolerant of high turbidity and eutrophic conditions. In 1995, two years prior to the carp exclusion, we planted three species of submergent plants in 12 enclosures, and even though only the sago pondweed managed to survive in several of the enclosures, it was evident that there had been sufficient light to penetrate the sediment surface even prior to carp exclusion. Another challenge with the submergent plants is that water levels in Lake Ontario are expected to decline further because of global climate change, and this will continue to favour the growth of emergent plants at the expense of the submergent community.